We are on our annual beach trip at the Outer Banks and I was thinking about the phrase that Aaron and I like to say at the beach. 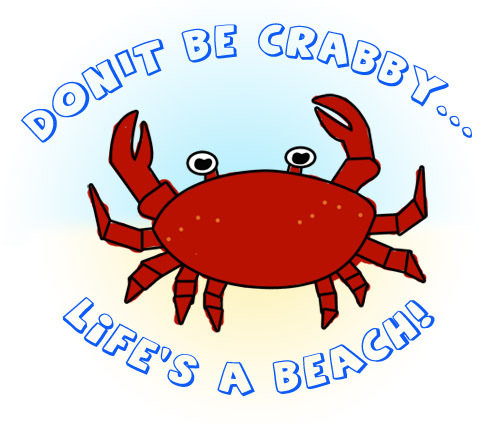 Don't be crabby... life's a beach! Neither is very original but put together we think it's hilarious and it suits many occasions. We often talked about using my Yudo to print t-shirts with our beach phrase and a crabby logo but I never got around to designing it. I even have two white American Apparel tees in our sizes waiting for the project. Well, I finally made the design late this evening after we got to the beach house and here it is. When I get home and have shaken off all the sand I'll print these up. This seemed like a good effort for Day 4 of 30 Days of Creativity! I love your design, ljc. When I saw the image I said to my boyfriend that if I saw a shirt with this printed on it, I would totally buy it. I'll be so proud to rock that tee shirt! Thanks Vangirl! Aaron I'll get working on it!